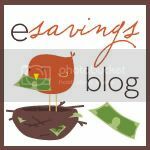 Esavingsblog is a blog that focuses on great deals I find on the web and off, coupons and frugal living and Reviews and Giveaways! How did you get started? My blog www.esavingsblog.com was created over a year ago as a way for me to share all the great deals and coupons I was finding and emailing my friends with. I then went on to offer reviews and giveaways as a way to give back to my readers. I also just started a new blog http://www.trendygirlreviews.blogspot.com/ which is a work in progress but is focused on trends, products & more. My favorite giveaway so far is a Scrubbing Bubbles GiftPack I created myself and put up as a giveaway. I hope to hold a bunch of great giveaways, offer more great deals and bring some financial tips to my blog. I am always looking for ways to expand my readership. My biggest challenge was getting it out there, design even though I am technical was hard as well because I am always changing things up. Blogging is a passion, I love to share my opinions and great finds. I love to be able to offer chances to win prizes and I love the people I have met blogging. Just to READ all the entry requirements Please. Newbie advice, you have to stick it out! It is hard work to get a blog going and get it out there. Some favorite blogs would be : kouponkaren, frugalcouponliving and many more! I am always at www.esavingsblog.com, you can follow me on Google Friends Connect, Twitter @esavingsblog and on Facebook! I also just signed up for networkedblogs so I need followers :-). Cute Blog! I love the bird. I went over and followed! And thank you Melanie glad you like it!